The map/scroll object was scanned/photographed and given to me as a high resolution digital image. Using image manipulation software, I traced the edges (outline of limbs, heads, weapons, hoofs) of about 300 characters (humanoid figures and horses) – using a digital cutting tool. Each character was placed on it’s own “layer: in the same image file but floating over the background. I then filled in the background using sampled color and pattern from the existing image. This would allow me to move the character across the background independently, while the background appears seamless and still. Because of the large file sizes, with all of these characters on discrete layers… I ended up with 18 different high resolution images containing various characters. Splitting the image into 18 pieces made it easier to work with in terms of file size and the computer power that would be required to work with that much information. Next I imported all 18 images into animation software that allows me to set up virtual cameras. These virtual cameras have properties that can be animated for instance… vocal range, way where the are positioned, what they’re looking at. I placed all 18 images on a digital canvas and positioned a camera facing the images. The images were arranged seamlessly from right to left so that all of their left edges were flush against the next image in the sequence. I then assigned to position keyframes to the virtual camera. 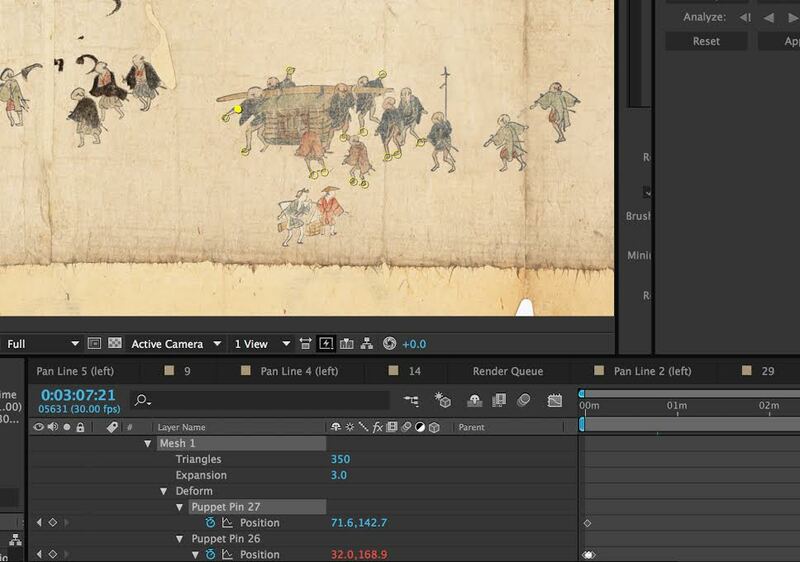 The first keyframe showed the very right-hand side of the image collage. The second keyframe displayed the very left-hand side of the image collage. The software would then interpolate or tween from the first keyframe to the second keyframe – creating the scrolling or panning effect. Because the 18 images were separate files, I was able to animate the character movement within a single file individually. In order to an animated character I first place position keyframes for each character so that as the camera panned across all 18 images, each character would be moving across the screen while in frame. Once I had done this for all 18 images, I began to make walking loops for each character. I wrapped a three-dimensional mesh around each character and assigned points to each of the characters’ limbs and created frame by frame walking movement for each character. I then used a simple scripting language to create loops out of this walking sequence. At this point the bulk of the work was done. I created a soundtrack and tweaked movement, details, and file format here and there. The finished result is a 12 minute 4K video and it was a lot of fun produce and I hope it adds an accessible and joyous element to the exhibition, another way to interface/view with the physical object by watching it move.